The winners of the Data Analysis Competition were David Kepplinger (Vienna University of Technology, Austria and United Nations Industrial Development Organization, Austria), Valentin Todorov (United Nations Industrial Development Organization, Austria), and Shyam Upadhyaya (United Nations Industrial Development Organization, Austria) with the work How industrial development effects the well-being of population: A detailed analysis to reveal the underlying mechanics. The poster presented can be downloaded here. 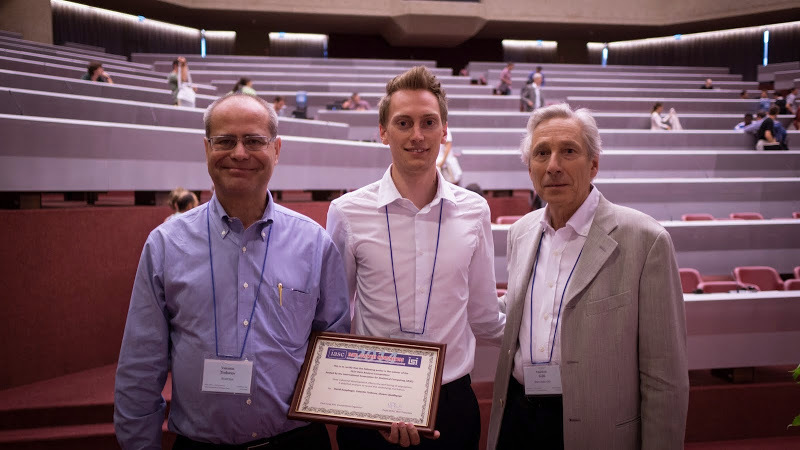 The winners presented their work during the closing session of COMPSTAT 2014 & the 5th IASC World Conference in Geneva on Friday 22nd, and were invited to submit a manuscript for possible publication (following peer review) to IASC’s official journal, Computational Statistics & Data Analysis. The International Association for Statistical Computing (IASC) announces the Data Analysis Competition 2014. IASC is an Association of the International Statistical Institute (ISI) and aims to foster world-wide exchange of technical knowledge among statisticians, computing professionals, organizations, governments and the general public, to convert data into information and knowledge. For the 2014 Data Competition, winners will be invited to present their results at the COMPSTAT 2014 & the 5th IASC World Conference in Geneva, Switzerland (August 19-22, 2014) and to submit a manuscript for possible publication (following peer review) to IASC’s official journal, Computational Statistics & Data Analysis. One of the goals of this competition is to connect the information from different data sets to obtain interesting and original conclusions. You must clearly specify in your poster how others can obtain your data, i.e., by listing the starting URL and the steps required to obtain the data. In your analysis, you may concentrate on a single country (e.g., your own country), a block of countries in an economic or political region, or even the entire world. You can also focus on a single year or on the temporal development, or on subregions/subareas within a country (if you can obtain such data). You are allowed to work individually or in a small group of up to five participants on your poster. (e) Generalizability of approaches to data sets in other arenas. Final submissions (PDF) are due on 15 May 2014. Final submissions (PDF) are due on 30 June 2014 (EXTENDED).